1. 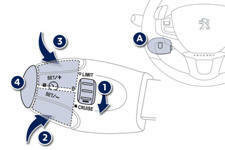 Cruise control mode selection thumb wheel. 4. Cruise control off/resume button. The cruise control cannot, in any circumstances, replace the need to respect speed limits, nor can it replace the need for vigilance and responsibility on the part of the driver.